Frank Lloyd Wright designed the Kalita Humphreys Theater, located along Turtle Creek in Uptown, which opened in 1959. In fact, it was his last completed project and one of only three theaters he designed in his lifetime, making it a historical landmark in Dallas. 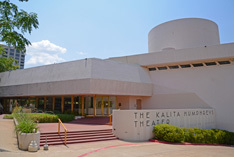 Formerly the home of the Dallas Theater Center, the Kalita Humphreys Theater campus is now used for local performing arts groups, including the Uptown Players, Second Thought Theatre, and the occasional DTC production that needs a more intimate-feeling space.